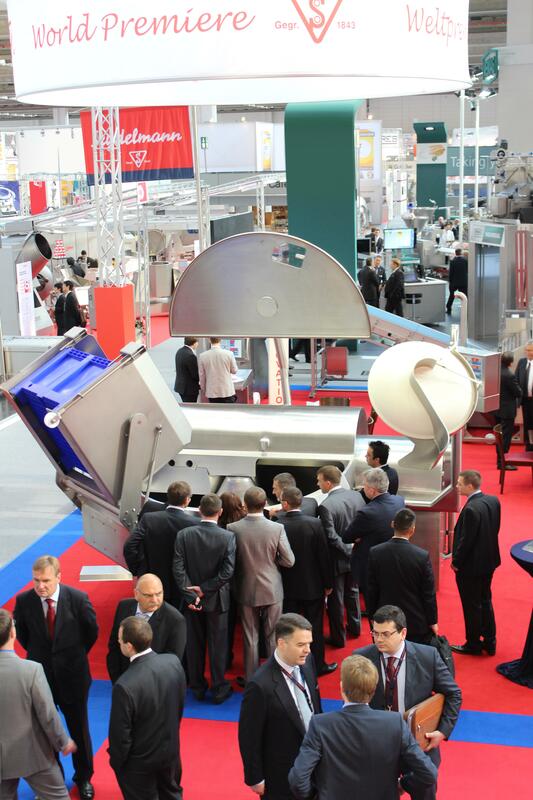 This year again, the leading international exhibition for global meat industry IFFA (May 4–9, 2013 in Frankfurt am Main, Germany) was a great success for the Maschinenfabrik Seydelmann KG. Both local butchers and representatives of international corporations were attracted to the two-storey booth of the machine factory from the South of Germany. 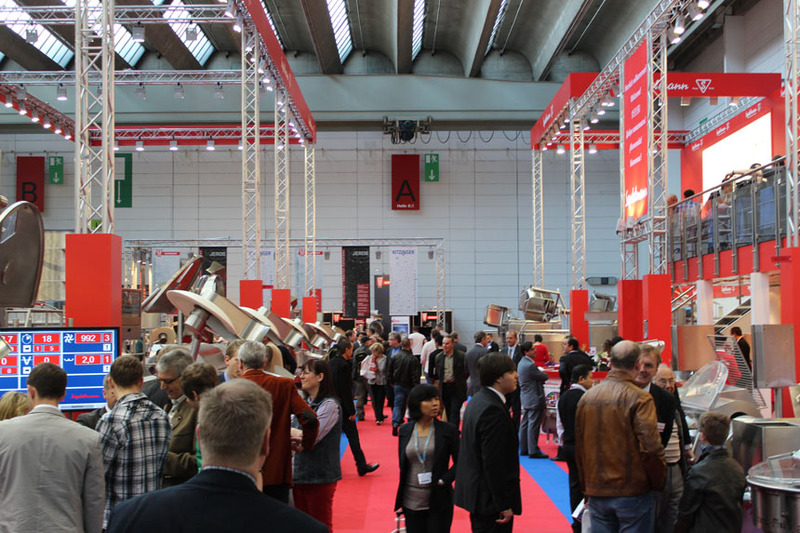 On about 800 m² Seydelmann was exhibiting nearly their entire machinery program, including cutters, grinders, mixers, emulsifiers as well as an entire production line. The visitors were highly impressed by the wide range of individual solutions provided by Seydelmann. Special visitor magnets were the Seydelmann innovations, most notably the impressive 1000 Liter Vacuum-/Cooking-Cutter K 1004 AC-8, the Universal Grinder AU 200 U, and the new Mixer-Grinder MRV 2500. Growing profitability and consistent high quality remain the benchmark for modern companies. Dominating trends of the IFFA 2013, innovation platform of the international meat sector, were efficiency and sustainability. Once again, Seydelmann has confirmed its pioneering role in the continuous development of proven technologies in the customers’ interest. All Seydelmann novelties presented at the IFFA 2013 have been developed in order to satisfy the highest demands on efficiency, hygiene, security and quality of the end-product as well as in order to set new standards. The widespread expert approval confirms that this goal has been achieved again. The world’s largest Vacuum-/Cooking-Cutter K 1004 AC-8 with a bowl content of 1000 litres was a true highlight of the exhibition. The unique high-efficiency machine is setting a new benchmark and proves its first-class performance through its highly developed technology, robust design, and ideal conditions for loading and integration into production lines as well as an easy maintenance. The Universal Grinders AU 200 U is introducing a new generation of grinders. It effortlessly reduces fresh meat, frozen meat blocks, cooked meat, and other food products whatever the consistency and temperature, without changing the working worm or cutting set. The newly introduced Mixer-Grinder MRV 2500, with a hopper capacity of approximately 2.500 litres and a mixing capacity of approximately 1.400 – 1.700 kg is the ideal machine for high utilizations of minced meat-, dry sausage-, hamburger-production and much more. The AU 200 and MRV 2500 as well as all other Seydelmann Grinders and Mixer-Grinders can be equipped with the newly developed pneumatic separating device. Already during the grinding process this device extracts a high amount of gristle and sinew, etc. and thus considerably improves the meat quality. The complete production line, shown by Seydelmann, was met with widespread interest. The experts paid special attention to the new ease of operation of the line via the innovative central operating terminal. The visitors furthermore greatly approved of the general design of the Seydelmann machinery, guaranteeing highest hygiene and extremely easy maintenance. The general feedback concerning exhibited machinery, individual solutions for every business, and the high quality and hygienic design of the machines was extraordinarily good. The numerous visitors were offered an attractive selection of sausage specialties by Seydelmann’s own customers. For further information about the Seydelmann novelties from the IFFA 2013 and other Seydelmann machines please write to info@seydelmann.com or call: +49 (0) 711 49 00 900. You can also visit www.seydelmann.com.